The total amount will be debited from your credit card one week prior to arrival. 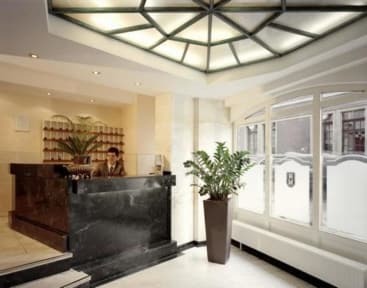 Situated only a few steps from the 'Grand Place', in the heart of the historical center, the Hotel La Madeleine is the ideal place to stay at. A charming old building with a listed facade of period architecture and 56 rooms with its own individual atmosphere. We guarantee you a warm and personalised welcome, and good combination of reasonable prices and good quality. Our hotel is located on Montagne Street. 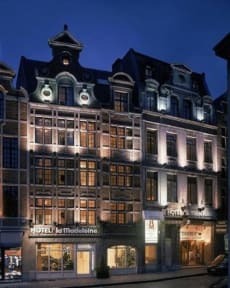 Dating back to the founding of Brussels, it takes it's place on the merchants route cutting through Brussels linking Flanders with the Rhineland. This street, which at first was not very large was flanked by numerous Inn's. At the end of the 17th century the street was enlarged to accommodate traffic. The hotel has an excellent location and the staff is really courteous and helpful. Great location very close to Grand Place and reasonably priced. The room was small but fairly comfortable, though the bathroom had no holder for the shower head or anywhere to hang towels. Fine if you're looking for somewhere central and aren't planning to spend any time in the hotel except to sleep. Super insecure. You leave your room key at the desk when you leave. I accidentally asked for the wrong room number when I got back and they just handed it to me without checking who I was. Same with the luggage store, people could just walk in and grab bags without the staff caring, I'm shocked nothing was stolen. Also, you have to lock yourself in your roomwith the ancient key, which is definitely a fire hazard since it could take a while to unlock. Location was the single redeeming factor for this hotel. My review would probably be better if I hadn't booked a single room with a "Shared Bathroom" as the other rooms seem much nicer. Apparently, "shared bathroom" really means "shared toilet, NO shower" (yes, NO shower). For one day this is fine, but longer would have been unbearable. Also, the room was so small the cabinet doors couldn't open, and it only had a single outlet (so you have to choose between watching TV or charging your phone). Location is perfect, halfway between the centrain train station and the main square. My room was a "bathroom shared" but had a shower and a sink inside. The toilette was only one per floor without any other facilities inside. Keep in mind that if you choose a shared bath room if could get one without a shower inside, and there are NOT shared showers on the floor. This is a big issue but I was ok with it since it was only for one night. Let's just say I won't be staying here again, and would not recommend it to my friends. Customer service at this place get's a 0 from me. Stood there in the lobby for 30 mins waiting to check-in, while 5 employees took care of others things before taking care of me, and other guests (there was like 3 of us waiting to check-in). The outside looks lovely, but the inside of the hotel was ratchet. The location is great, cant argue with that, but the overall experience wasn't pleasant.